Niall Horan has revealed in a recent interview with ‘We Love Pop’ magazine that the One Direction lads got a ‘serious dressing down’ from their management over their 18th Birthday Celebrations. Niall admitted that when he and his fellow band-mates turned 18 – they decided to visit the casino. All harmless given they legally entitled to go to a casino – however, the band got a serious telling off once their management found out they had been spending/gambling significant amounts of money… oh dear! ‘I won £100, which seemed reasonable, then I stopped. But I’ll have to say, ‘No comment’ about the others. Louis said: ‘I think that’s the beauty of being in a band. Often people who have had fame from such a young age as solo artists find it harder to stay grounded, because it’s just them. Do you think the boys were irresponsible – leave us a comment below! The full interview can be read at We Love Pop Magazine. 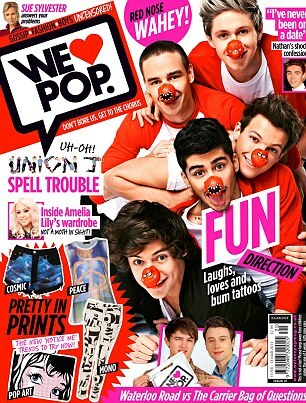 One Direction on the cover of We Love Pop Magazine which has a full interview with the boys. ← One Direction Dolls to be released by Hasbro!